Suitable for most motorcycle Sat Nav's with a 5'' and 4.3'' screen, such as Garmin Zumo and TomTom Rider Models. With this really handy device you can improve the visibility of your Sat Nav when riding. The strap design provides a secure hold. 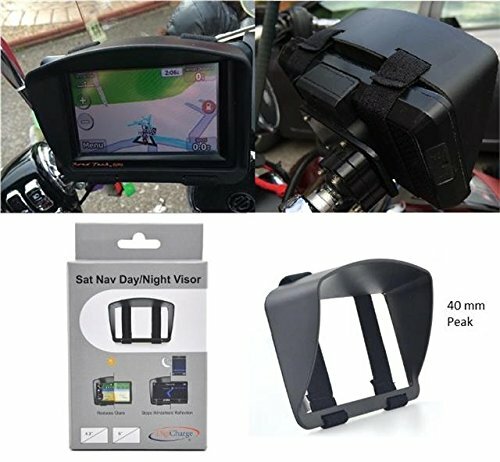 This design is unique to Digicharge and offers an improved fitting solution compared with other Sat Nav visors available on the market, whereas they use clips or legs which can easily break and don't offer the most secure fit and so aren't suitable for using on a bike, this strap solution provides totally secure fitting using robust elastic which is able to cope with hot and cold conditions as well as wet. Once fitted the visor can stay in place permanently if so desired, even during storage in a holdall style bag and then it's ready to go in place the next time you need it. The visor is a stylish addition to your Sat Nav. The straps have a sleek profile at the back which makes the high quality moulded plastic of the visor seem as one with your Satellite Navigation device. Designed to rest on the front of your GPS on the surround of the visual display. See images for examples of how the mount fits (not necessarily showing your model). Although this visor rests on the front of your GPS it does not cover the visual part of the screen and full functionality is retained. If you have any questions about this product by Digicharge, contact us by completing and submitting the form below. If you are looking for a specif part number, please include it with your message.